This is what we would describe as a beginner level kit. Something to learn the basics of Card Modeling on without investing a lot of time or money. It is a “Low Relief Flat”, meant to be positioned against a backdrop. With a bit of creativity and some additional material, it could be made into a complete building. that you could have found almost anywhere in the country from the 30’s on. It’s a bit run down, but that’s what gives it character. A small model that will fit almost anywhere. Comes with steel plate inserts to place on the rails to cover the scale mechanism. where the water had to be protected from freezing. 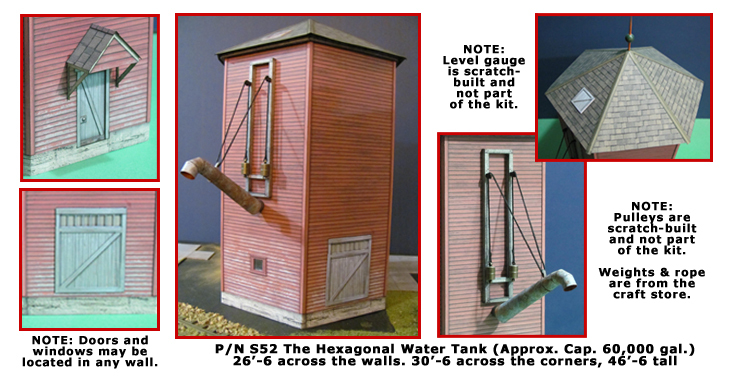 Tanks, similar to this one, were found on the CP, CN and the O&W. of kit-bashing a cardstock model, can be built larger or smaller to suit your needs.